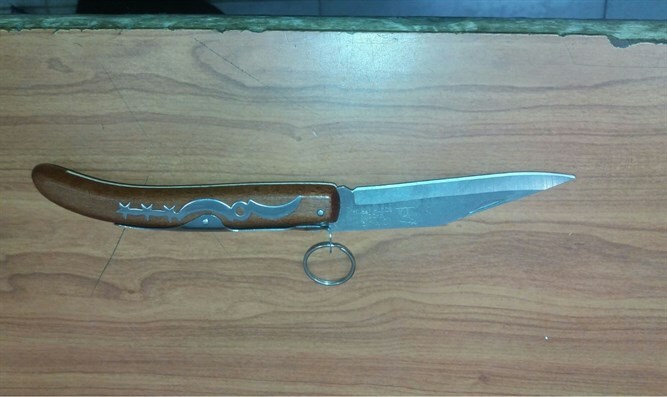 Terror attack prevented at Hevron holy site when police stop Arab concealing knife in his clothes. An Arab aroused the suspicion of the Border Police when he approached an inspection post near the Tomb of the Patriarchs in Hevron Wednesday. The officers asked the suspect to remove all items he was carrying, but continued to be suspicious when he claimed to have shown them everything he had with him. The officers searched him and discovered a knife hidden in his clothes. According to the Border Police, the suspect's behavior and refusal to reveal that he was carrying a knife indicate that he was planning to carry out a stabbing attack at or near the Tomb of the Patriarchs. The suspect was arrested and taken for interrogation by security officials.